The Unites States Agency for International Development (USAID), through CORE International, Inc., provided advisory services to the Ministry of Energy of Georgia in a host of energy sector issues including national energy policy reform, energy sector reform and governance improvement, medium and long term sector strategy development, public awareness and public participation methodologies to engage the public in an informed dialog on reforms, development of a Ministry-wide energy management information system, as well as assisting the Ministry in the day to day sector policy issues. CORE’s advisory support to the Ministry included assistance in (i) the development of new legislation to aide in implementing reforms, (ii) development of amendments to existing energy laws, (iii) policy papers on energy regulatory approaches and market structure, (iv) issues surrounding energy security and vulnerability, and other areas such as creating a wide-scale understanding of the role energy plays in economic development among various stakeholders including consumers, service providers, policy makers and politicians. CORE International, Inc. provided Georgia’s Ministry of Energy with technical assistance in policy development, implementation and reform related to energy sector issues. The Project also demonstrated the benefits of an open and transparent sector governance process in terms of documented public confidence in the Ministry of Energy, a remarkable change from the immediately preceding turmoil in the energy sector in Georgia under the Soviet era. A comparison of the strengths and capabilities of the Ministry staff at the beginning of the Project and the current staff competence and operational improvements in the MoE clearly demonstrates that this Project was designed and implemented in a very timely manner to meet a strategic energy sector governance need in Georgia. During the project, the CORE Team coordinated its activities with a number of Georgian and international energy sector organizations and individuals. Starting in summer of 2004 from empty desks, indeed often empty offices with no desks, by the end of spring 2005 the project had installed and enabled the physical network including wiring, computers, and software of an internal Ministry MIS system. The Project also assisted in the development of a functional MoE website and the reconstruction of a completely emptied database of documents and energy sector data and information important to the MoE. Other activities within Component (1) included: (i) the provision and installation of accounting systems software for Ministry self-management; (ii) the establishment of document tracking system for Ministry self-evaluation and management; and (iii) the design and delivery of training to the MoE staff in the operation of these systems. As a result, the Ministry is now self- sufficient in the operation of all of the management information systems. The results of assistance under Component (2) are also evident in the functioning of the Ministry. At the outset of the project, the MoE and the Minister, specifically, had essentially no staff capable of carrying out the numerous analytical tasks required for energy sector planning and policymaking. Initially, the project filled in those staffing needs and enabled the Ministry to gain control of the principal policy-making functions expected of any Ministry. Over time many of the skills and capabilities were gradually transferred to the Ministry staff. The trainings and seminars provided to the Ministry were targeted trainings specifically requested by the Ministry to meet capacity challenges within the organization. Some of these trainings were very hands-on and geared toward increasing personnel efficiency such as the software training, English language training, and energy statistics methods. Other seminars were delivered to communicate analytical findings to Ministry personnel and other stakeholders such as the results of the project's Gas Study and the relevance of the Dispatch Model for energy sector planning. At perhaps a third level, the training seminars exposed Ministry personnel and other stakeholder representatives to some fundamental issues in sector planning which they may have had no exposure to previously such as electricity system reliability issues and regional energy trading. On a practical level, the Ministry staff likely utilized the skills development courses the most in their daily work. A wide range of services were provided to the MoE including: (i) day-to-day support in energy sector policy and planning as well as operational activities such as responding to letters requiring research, (ii) energy sector planning and policy analysis, and (iii) and responding to topical inquiries from the MoE in order for the Minister to take an active role within the Government in overall sector governance. For example, the development of the eventually passed Amendments to the “Law on Electricity and Natural Gas” required more than 20 minor variants and 11 major variants to the specific provision and intent of the Law. The project provided the staffing requirements for these very diverse activities. It also arranged for and managed the provision of specialty technical services by a number of external experts. As the activities of the Ministry stabilized, the initially nebulous Component (2) transformed into a more clearly defined Component (3) -- provision of specific analytical services to the MoE, each with a defined objective and purpose. The second of the two major USAID revisions of project objectives also embodied these tasks into specific project deliverables and a more defined set of activities. Under Component (3), the Project completed seven major technical studies: (i) three pre-feasibility studies of concrete major physical projects for improvement of the performance of the energy sector; (ii) three analytical studies covering a broad range of strategic issues facing the Georgian energy sector; and (iii) the creation of analytical software for strategic analysis of the power sector in Georgia. The three physical studies had a similar origin, and similar purpose. In the Soviet era, several engineering studies of major energy projects were conducted. These included the Khudoni and Namakhvni HPP projects and the South Georgian 500 kV transmission line. The Ministry requested CORE to significantly modify and expand these studies including a detailed economic and financial analysis for each project with the view to attracting potential private sector investors or other source of funding for conducting a full feasibility study. In all three cases, the resulting studies prepared by the CORE Team have had exactly the intended effect – they have leveraged further support to the Georgian Government from the World Bank, the U.S. Trade and Development Agency (USTDA), and the U.S. Millennium Challenge Corporation (MCC)/Millennium Challenge Corporation Georgia (MCG). A fourth study of the possibility of placing a gas storage facility in Georgia was also completed under the Project. This study has also resulted in strong donor interest in project financing. The three strategic analytical studies focused on three specific areas of critical importance to the Ministry of Energy: (i) issues surrounding a “Gas Strategy for Georgia”, (ii) system planning for a long-term power system “Energy Balance” for Georgia, and (iii) a strategic Business Plan for the newly merged Georgian Oil and Gas Corporation. These studies provided a package of detailed inter-related analyses of the energy security of Georgia. Specifically the studies addressed two critical questions: (i) How can Georgia enhance its energy security through the deployment of existing resources? and (ii) What additional external resources are required for the future development of the energy sector? These studies advise on the strategy for the best use of the GoG borrowing capabilities, minimization of use of natural gas, and demonstration of how long-term hydrological conditions affect the ability of Georgia to become self-sufficient in hydropower energy if it chose to follow this path. The first two studies were received with great interest by the GoG and led to the request for a third strategic study – the development of the “GOGC Strategic Business Plan”. 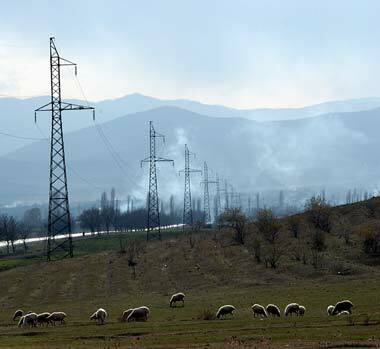 The fourth analytical product -- a model of the operation of the Georgian power system -- was developed in the course of conducting the three major pre-feasibility studies discussed above. This model was developed to facilitate the economic evaluation of the three projects covered under the three pre-feasibility studies. The model was also applied as the analytical foundation for the two studies of Georgian energy security. That analytical model was provided to the Ministry of Energy and the Ministry staff were provided extensive training in its use. The model was also requested by the newly formed “Electricity System Commercial Operator” (ESCO). Given the wide appeal of the usefulness of the model, it was translated into the Georgian language and provided to a number of energy sector stakeholders. Training in the use of the model for a variety of strategic analyses was also provided to the staff of various energy sector entities including the ESCO and the State Transmission company, the Georgian State Electricity company (GSE). The above activities supported the very active role of the Ministry of Energy in the reconstruction of the energy sector of Georgia in the areas of better planning for future energy resources, regional cooperation for increased energy security, greater governance and transparency related to government actions to stabilize and improve the sector, and support commercially geared practices to increase the solvency of energy sector entities previously in financial disorder. Concurrently, an important part of Component (4) was to assist the Ministry in developing greater public confidence in and acceptance of the Government’s energy sector policy and planning process. Specifically, this included activities aimed at educating the public in the practical realities of management of a viable power system. This was vital to avoid “backsliding” in the future and to gain cooperation of the public in the often difficult choices they were requested to make. This area of work posed significant challenge to the Ministry as the previous decade of Georgian history was rife with corruption and distrust in the Government and the highest public distrust was directed against the Ministry of Energy for its equally high perceived level of corruption. The indicators in the Performance Monitoring Plan (PMP) of this Project demonstrate that public trust in the energy sector governance process has improved as a result of the Ministry of Energy implementing a variety of public education and outreach activities developed under the Project. The Project also demonstrated the benefits of an open and transparent sector governance process in terms of documented public confidence in the Ministry of Energy, a remarkable change from the immediately preceding turmoil in the energy sector in Georgia under the Soviet era. A comparison of the strengths and capabilities of the Ministry staff at the beginning of the Project and the current staff competence and operational improvements in the MoE clearly demonstrates that this Project was designed and implemented in a very timely manner to meet a strategic energy sector governance need in Georgia.